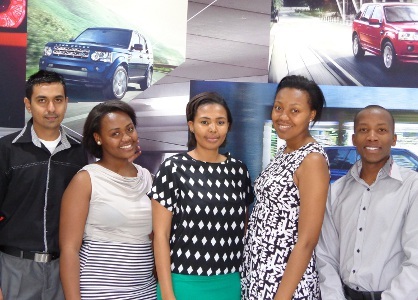 Jaguar Land Rover South Africa’s first ever graduate development programme is already bearing fruit, with a group of young South Africans having made their mark since joining the company. The five took up positions in Finance, Marketing, PR, Operations and Customer Services at the beginning of July and are on track to progress through a 2-year development plan, with the overriding goal of them building a successful management career in the greater JLR world. The local programme mirrors a similar initiative in the United Kingdom which has seen the total number of graduates recruited in the last three years reach almost 1000. Early weeks at JLR SA included a full induction programme and a day at Land Rover Experience Kyalami, where they learnt both off-road and defensive driving skills. They also underwent global corporate induction in the UK, along with some 300 graduates from around the world. Each of the graduates is employed full time, and given real objectives that support the business, their level of responsibility growing as they gain confidence and learn the business. The graduate development programme also supports JLRSA’s longer term B-BBEE strategy by providing real-world opportunities for graduates from previously disadvantaged groups. Says JLR SA and SSA’s Human Resources Manager, Hannah King: “It is our objective to turn this into an ongoing process, where we seek out individuals who can benefit from our expertise and at the same time add value to our business. They have a real ability to bolster the JLRSA team and prepare us for future growth – and at the same time develop into the leaders of our future.